Stigma • Organizers demand that schools change attitudes about tormenting gay youths. 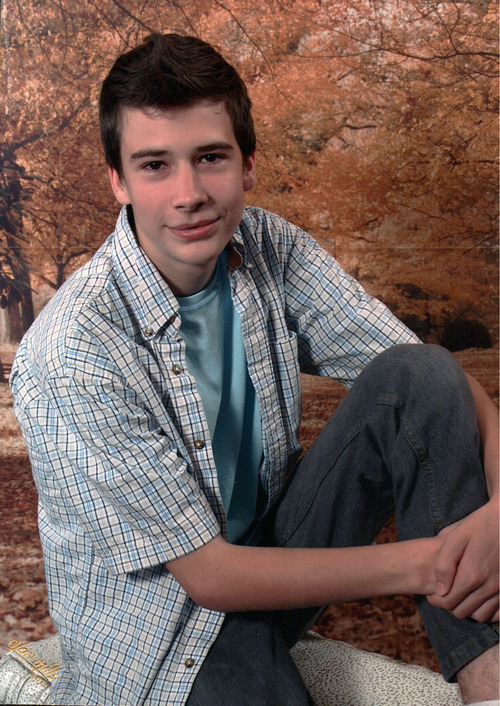 The April 22, 2012 suicide of Jack Denton Reese, 17, Mountain Green, has prompted northern Utahns to face the tragedy of lesbian, gay, bisexual and transgender youth suicide. Photo courtesy of Myers Mortuary, Ogden. A week ago, an overflow crowd at the Weber County Library watched a documentary about the torments endured by gay, lesbian, bisexual and transgender teens at the hands of bullies. When 18-year-old Alex Smith's turn came, he told the audience about the bullying his boyfriend experienced at his high school. Unbeknownst to Smith or anyone else, Mountain Green resident Jack Denton Reese, 17, had ended his life the previous day. Funeral services were held Friday, and he was buried in Ben Lomond Cemetery. Reese's death is the latest known suicide of a gay teen in northern Utah, and the community is responding with an event Tuesday night at the Ogden Amphitheater to support LGBT youths, to grieve and to speak about the outrage of bullying, said Marian Edmonds, executive director of Ogden's OUTreach Resource Center, an advocacy organization for LGBT youths. The purpose is to demand change in the attitudes of individuals and institutions, particularly schools, about all types of hazing and harassment, but especially that aimed at gay teens, Edmonds said. The community dialogue, which will conclude with a candlelight vigil, also aims to shine a necessary light on teen suicides so often shrouded in secrecy and shame. That was the aim of OUTreach; Parents, Families & Friends of Lesbians and Gays (PFLAG); Services and Advocacy for GLBT Elders (SAGE); and the Weber State University LGBT Initiatives when the advocacy groups on April 23 screened "Bullied," a 2010 documentary film produced by the Southern Poverty Law Center. The film chronicles one student's ordeal at the hands of anti-gay bullies in middle and high schools. "There are so many suicides no one ever hears about," Edmonds said. The terrible coincidence of Smith's description of Reese's ordeal became known April 24, when Smith shared the news of Reese's death on Facebook. From there, "it just snowballed," Edmonds said. "The way it all unfolded, there was this huge response: 'Oh, not another one.' "
An obituary posted by Myers Mortuary said Reese died in Mountain Green. He was good with computers, enjoyed skiing, loved animals "and will miss his cat, Cat." He was artistic and learning Japanese. Kendall Wilcox, a gay man and former executive producer at Brigham Young University's broadcasting department who was fired after making a documentary about being gay and Mormon, will be a speaker at the Tuesday night event. He said he has been told by authorities, unofficially, that the suicide rate for LGBT youths or adults in Utah is one per week. Wilcox works with Edmonds at OUTreach, where he met Smith and is working with him on other film projects about bullying. National experts who have assessed how schools deal with bullying have been critical of Utah, he said. "The number one tactic for bullying is homophobia," Wilcox said. "Whether the child is gay or not, the epithet with the most detraction is 'fag.' It's so systemic. It starts with parents, swings through the students and goes to school administrators. On either end of that is adults. It just compounds and compounds itself. Clearly the suicide [rate] is precipitated by an unwelcoming society." Charles Lynn Frost, a Salt Lake City actor and activist, is co-producing the Tuesday event. "There is a problem [with bullying] in all school districts," he said. "Some are addressing the issue much more courageously than others. ... Everybody should be safe in their school, period, no exceptions." Weber School District spokesman said that although Reese wasn't a student at Weber High at the time of his death, the school offered help to grieving students. "As students started to be aware [of his death], we did have counselors on call," Nate Taggart said. Weber District student services director Bob Wood said the district has a formal set of policies to counter and punish bullying. "We want to make sure all of our students are safe from any threat, physical threats, hazing, bullying, discrimination," he said. P An event where northern Utah residents will discuss LGBT teen bullying and suicide is scheduled for 6:30 p.m. Tuesday at the Ogden Amphitheater, 343 E. 25th St., Ogden. A candlelight vigil will follow.